← Millions of Americans take vitamin D. Most should just stop. This simple, high-temperature cooking method condenses both the sweet and savory qualities of sweet potatoes. Preheat the oven to 500°F. Peel the sweet potatoes and cut into 1-inch thick rounds. Arrange on a half sheet pan, not touching. In a large bowl toss the potatoes with the butter/coconut oil mix and the salt and pepper. 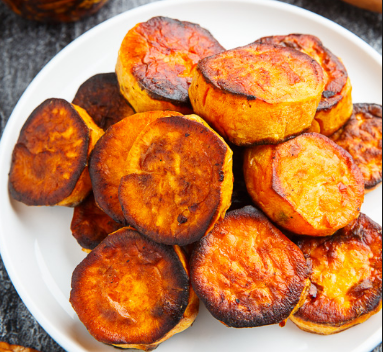 Roast the sweet potatoes for 15 minutes, or until the undersides of the slices have caramelized to a deep brown. Carefully flip the sweet potato slices and return the pan to the oven for another 15 minutes. Flip the sweet potato slices once again and scatter the chopped or garlic , or garlic granules, over the sweet potato slices and then pour the broth over the potatoes. Return the pan to the oven for another 15 minutes, or until the potatoes are completely tender and the broth has reduced to a thicker consistency. Use a spatula to transfer the Melting Sweet Potatoes to a serving plate and drizzle the sauce from the pan over them.